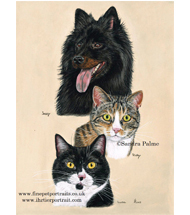 If you would like to commission a custom pet portrait, e-mail me or fill in the contact form to let me know. If possible, attach a photo or two of the pet you would like me to draw. If you haven’t got a scanner, you can send the photo in the mail. Great care will be taken of your photo(s) and they will be returned with your portrait. You also need to decide whether you would like a charcoal or pastel portrait and whether it should be a head study or a full body drawing. If you are unsure, I am happy to discuss this with you. I will of try to draw your portrait as soon as I can once I’ve received your photo but please allow up to three weeks (longer when I am really busy). I will try to make birthday presents a priority, but do try and send your order well in advance to avoid disappointment. The same goes for Christmas gifts. Order your portrait early to avoid the queue. What if I don’t like the portrait? I’ve got a no risk policy: when I have finished your drawing, I will e-mail you a scan or digital photo of it. If you really don’t like it, you don’t have to buy it. I want you to be happy with my artwork! I will make changes until you are completely satisfied. If I really don’t succeed, you don’t have to send payment. As simple as that! So you’ve got absolutely nothing to lose. I can also send you scans of the ‘work in progress’ so you can watch your portrait come to life! Please note that I retain the reproduction/copy rights of my artwork; no drawing may be copied, reproduced or published without my permission. I reserve the right to use a scan of my drawings on my website or for advertising purposes.